Leading companies at the Chemelot site continuously invest in the development of new methods and technologies to work more sustainably, efficiently and effectively. 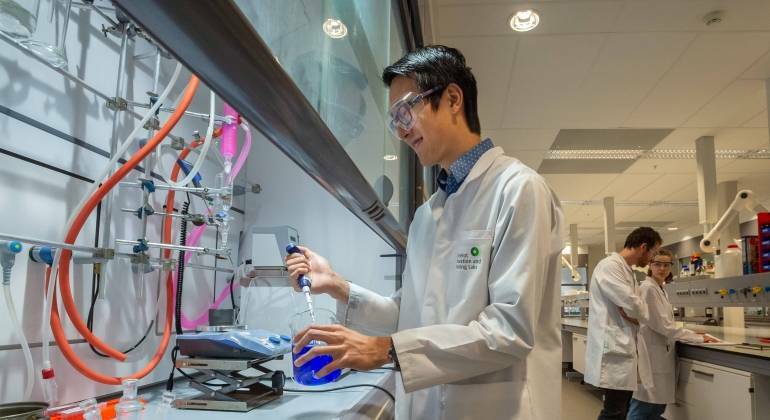 The Brightlands Chemelot Campus and the companies located on the industrial site are working on Research & Development (R&D). These companies collaborate with research institutes and schools where knowledge, PhD research and graduation projects are combined. Within the campus, an environment has been created with state-of-the-art facilities where scientists from different institutions and companies work together to create the best breakthroughs in health and sustainability. We invest heavily in scientific talent and opportunities to turn bold ideas into new companies. Innovation is crucial to maintain the position of leading chemistry site. Together with colleagues from the R&D department, you will work on all kinds of issues and solutions for all divisions. These are applicable short-term solutions, but also groundbreaking innovations for the long term. As an R&D professional at Chemelot you are on the verge of appealing innovations that make a difference in the world.